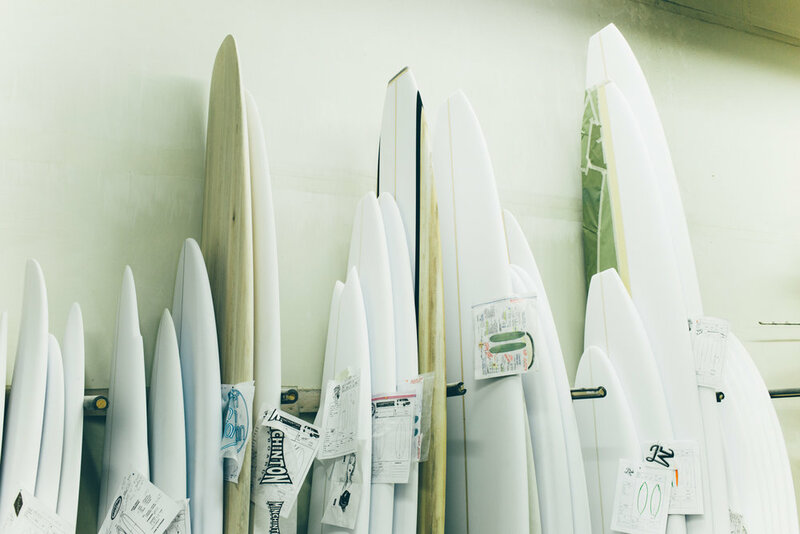 The Robert August Surf Company is a staple in Orange County, California, known for making some of the country’s best surfboards. Located in the beachside town for almost 7 years and producing surfboards since 1974, you’ll be hard pressed to find a surfer in the area that doesn’t frequent the shop often. All custom made and hand shaped, the Robert August team uses no machines to form their boards, preserving the wood-working craftsmanship in which the sport owes its origins. By doing this, each board is an original work, made specifically to each customer’s specifications. They even take into consideration where the customer surfs: This extra step is a specialty in the industry, insuring each rider has the optimal board for their local terrain. The Robert August Surf Company’s notable craftsmanship process begins with an assessment of each client’s needs, taking careful consideration that each board is molded perfectly to the athlete. A thorough diagnostic of the customer’s body follows, as each board is fit perfectly to the surfer’s height, weight, body type, and particular surfing habits. Once the design of the board is cemented and approved by the client, the meticulous and highly-skilled craftsmanship process begins. At this step, the Robert August Surf Company segments themselves an echelon above any other surf shop in the country, as their team of artists sees each board as a design and a creation, an original piece of art to accompany surfers in their adventures to conquer and surf waves on their home turf and around the world. To begin the board-making process, every tradesman is given a task that makes up the final product, with each of them having crafted boards for years on end. Housed in a glass-making facility, the Robert August Surf Company has a number of artists in their ranks. The makers are also surfers themselves. This adds even further to their quality of boards, as the artists know what their optimal surfboard would look like, both in terms of functionality and design. An expert woodcarver shapes the board, and another craftsmen hand-shaves the board, perfecting the perfect contour on each end. Another artist selects the proper color and design for the board, sealing in the final paint outline. Someone then glasses the board, giving that glossy finish we all know and expect from our surfboards. As you can see, this is a long and highly-detailed process, making the Robert August Surf Company an icon in the industry, setting the bar for a high-touch, acutely detailed schematic that makes the shop so revered. Whether in Nicaragua or on the California coast, the Robert August Surf Company knows a thing or two about the world’s geography. If you walked in today and told them you surfed in Nicaragua, they would take this into consideration and craft the board to fit the destination specifically. As the Robert August brand is synonymous with the core surf market in the United States, it’s a natural fit for the brand to appeal to surfers in the connecting Central American scene, as many of the athletes in California will visit Central America in search of the perfect wave. It’s even said that the brand was somewhat born in Costa Rica, Nicaragua’s neighbor, as many athletes travel up and down the Pan-American Highway in search of the optimal weather patterns for prime surfing conditions. As an expert in their craft, Mukul enlisted the surfboard purveyors to create custom, in-house boards, specifically crafted for the property’s guests. As part of Mukul’s Endless Summer campaign, you can now order your very own surfboard when you book one of the property’s special offers. As the Robert August Surf Company is rooted in community, lifestyle and family, Mukul hopes to welcome you into their Nicaragua family. Enjoy the culture and vibrancy of Nicaragua while enjoying the surf, one of the country’s most iconic adventures. Having a custom surfboard will even further your adoration of the lifestyle and community that’s synonymous with surf and life at Mukul, beachside oasis set pristinely on Nicaragua’s Emerald Coast.